Can co-working spaces cultivate an environment fostering innovation and creativity? We can acknowledge without any doubt that co-working spaces are essential to our urban work culture today. Going by industry estimates, their presence and reach is on the rise as well. 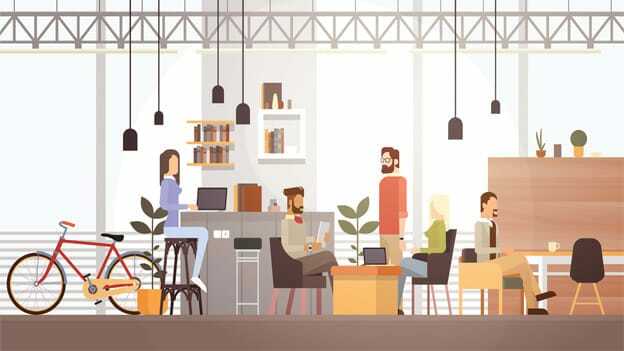 Referred as “workplace of future” by some, co-working places are “membership-based workspaces where diverse groups of freelancers, remote workers, and other independent professionals work together in a shared, communal setting”. Industry observers, scholars and researchers are keenly following wide-ranging features of this fresh phenomenon of twenty-first-century economy. Some of the significant questions that fascinate us are – How does the typical nature and characteristics of co-working spaces have any influence on the learning practices of users? Can co-working spaces cultivate an environment fostering innovation and creativity? Co-working spaces, because of their unique characteristics, mark a departure from some established theories on organizations. People operating out of co-working spaces mostly belong to any of the following categories: employees of startups, employees of any organization who are teleworking, independent professionals, entrepreneurs, part-time workers, and freelancers. The idea of a diverse mix of people with varied affiliations and working from a common workplace challenge the fundamental concept of a conventional organization, as a strong anchor for its employees to identify with. It is the absence of a distinct and familiar physical surrounding and work-environment, uniquely correlated with employer organization here! So, how do people learn in such an unusual workplace? In our research, we approach this question through the lens of “Organizational Identification”, which refers to employees’ sense of belongingness to their organization and association with its objectives and values. It is rooted in social identity theory, which describes how people attach their identity to various groups and reflect the norms and mental models of the group in their behavior. Working out of a co-working space offers flexibility and mobility – and consequently also raises challenges for organizational identification. A conventional organization provides a stable social structure to its employees - reinforced by regular interactions, norms, processes, values and beliefs, artifacts and organizational symbols present in the workspace. They are definitely influential elements in the identification process. However, in a co-working space, these common cues tend to get diffused or diluted, and even altered to a considerable extent. Additionally, for co-workers belonging to new entrepreneurial ventures and startups that are in their initial stages of establishing an identity for themselves - developing a sense of organizational identification can presumably be even more challenging. So, how do people develop a sense of identity in a co-working space? We propose that they do so by knowledge sharing and learning through practice in their specific social context - when they are brought together by an interest in a common knowledge domain. That way, co-working spaces fit the description of what was earlier referred as “Communities of Practice”. By providing common infrastructure, facilities, and shared spaces for interaction, they offer a platform where employees from different organizations or affiliations are more likely to engage with each other and develop a sense of community. This gradually develops a sense of identity among people in a co-working community. Identification in the co-working community is likely to be a function of several elements. For example, if co-workers share similar professional interests, they would be expected to engage in more voluntary interactions. The frequency and quality of these interactions would impact the level of identification – the higher the frequency and the greater the quality, the stronger would be the sense of identification. Social interactions among individuals, when endorsed by co-working space operators, would lead to a stronger sense of identification. Eventually, it is likely to lead to a higher degree of cooperation and information sharing, which would in turn positively impact learning and innovation. Currently, we are trying to find answers to questions such as: How do we measure the degree of identification in a coworking community and what factors influence this? How to identify elements that prevent or promote knowledge sharing, learning, and innovation within the coworking community?